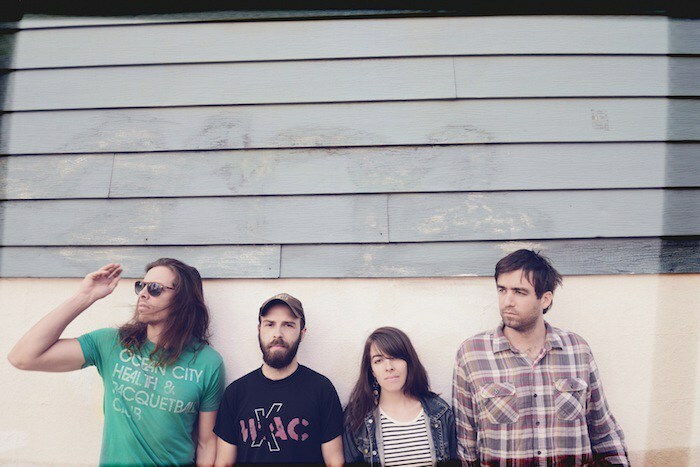 Latest single 'Powerful Man' proves Hop Along's second album, Painted Shut, (02/05/15 via Saddle Creek) to be a record of overdrive, emotive raw vocals, and barbed catchy melodies. Somewhere more energized than slacker rock and more emotive than punk, Hop Along write jerky and exciting indie rock songs with wildly changeable pop-influenced melodies. 'Powerful Man' is full of energy and anger, with Frances Quinlan's incredible vocals effortlessly moving from scratchy danger to falsetto charm. The guitar riffs wind around each other in non-stop inventive joy, while the bass lines play tag with the drums. Both 'Powerful Man' and previous single 'Waitress' are original, individual and hugely powerful. Recorded and mixed by John Agnello (Kurt Vile, Dinosaur Jr, Sonic Youth) in Philadelphia and Brooklyn, Frances is joined by Mark Quinlan (drums), Tyler Long (bass) and Joe Reinhart (guitar).